Eligibility: A permanent resident of Assam residing in the District. Remuneration: Monthly salary of Rs. 12,000/-PM. 1. 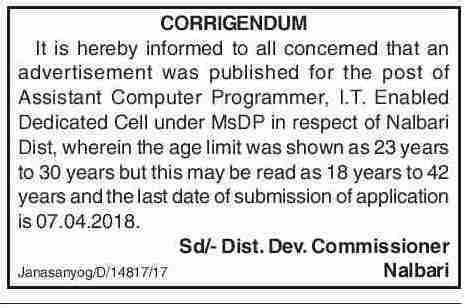 This engagement of Assistant Computer Programmer is purely temporary and initially for a minimum period of one year. 2. This engagement is scheme specific Depending upon the centrally sponsored scheme (MsDP) and sanction & release of fund from Govt. of India, the engagement of Assistant Computer Programmer will Commence and continue. 3. Payment of remuneration will be subject to the release of fund from the Govt. of India, New Delhi. 4. The engagement may be terminated without assigning any reason if the performance is found to be not satisfactory. 5. The person can not claim any appointment/engagement under regular Govt. establishment by virtue of his/her performing duties as a temporary appointee. 6. Last date of submission of application: 07.04.2018. 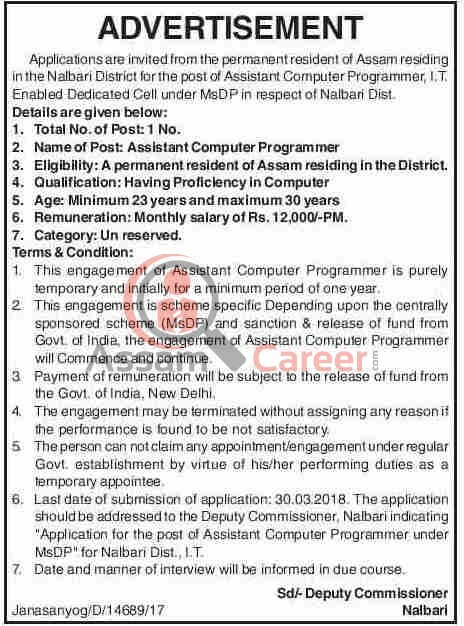 The application should be addressed to the Deputy Commissioner, Nalbari indicating "Application for the post of Assistant Computer Programmer under MsDP" for Nalbari Dist., I.T. 7. Date and manner of interview will be informed in due course.